Riders at Murton Equestrian Centre. 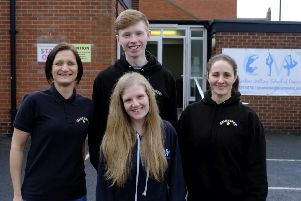 A charity fundraising day will be the mane event at a North Tyneside riding school this weekend. Murton Equestrian Centre, near Whitley Bay, will be horsing around to raise funds for Macmillan Cancer Support. The open day on Sunday will include pony rides, riding demonstrations and an array of stalls run by local businesses. There will also be a cake stall, hot food, a tombola and raffle, while youngsters can visit Pony Club Corner to pamper the horses and join in fun competitions. The event has been organised by centre owner Leigh Belbin for a cause close to her heart. She said: “Since being diagnosed with breast cancer last year the support and care I have received from Macmillan has been incredible. I really wanted to do something to support it in return. “We’ve had open days in the past and they’ve been great fun and very popular so I thought it would be a perfect opportunity to raise some money for a truly deserving cause. “The staff and the ponies are looking forward to welcoming lots of people. The event runs from 1pm to 6pm.